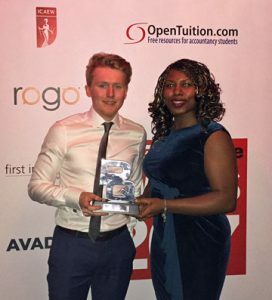 NCASS are delighted to announce that we have been crowned Student Body of the Year 2017 at the national PQ Awards held on Tuesday 21st February! Our night at the PQ Awards was filled with entertainment and celebration! The awards were wide-ranging, and nominees travelled from across the UK and abroad to attend the event. ‘Student Body of the Year’ was the first award of the night….NCASS were up against tough opposition, including another ICAEW student society (BCASS), Accounting Student Network Facebook Group, CIPFA Student Network and North West CIPFA Student Network. For NCASS to come out on top is testament to the hard work and commitment of our committee, both past and present, and this was recognised when we were presented with the award. The award provides both reassurance that NCASS have done a great job, and motivation to continue doing all of the things which allowed us to win on the night. We have a great programme of events lined up for 2017, and NCASS wants to encourage all of our student to be involved! Ian Cameron and Sandra Nwanze collecting the award on behalf of NCASS.